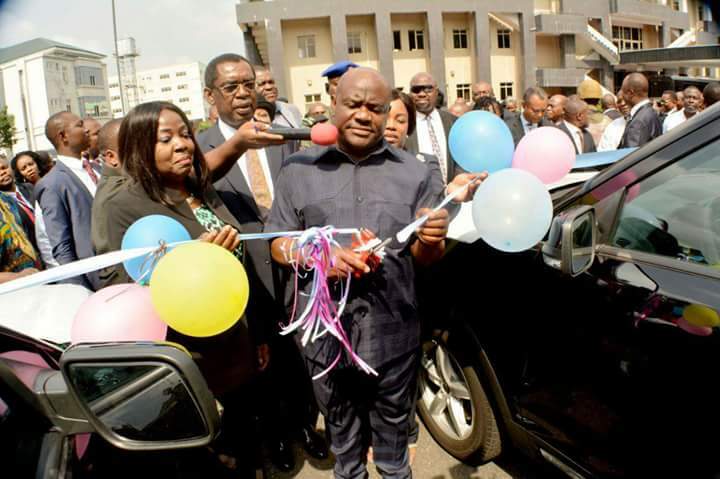 To further enhance the administration of justice in Rivers State , Governor Nyesom Ezenwo Wike has handed over 35 Sports Utility Vehicles to the Judges of the State High Court and Customary Court of Appeal . Commissioning the vehicles for distribution to the judges at the State High Court Complex in Port Harcourt on Friday , Governor said: "What we are doing as a government is to give judiciary the support to enhance the administration of justice ". The governor said that judges require the right environment to administer justice, pointing out that effective transportation framework is necessary for judges to arrive courts on time to preside over cases. He called on judges to be committed and courageous to the administration of justice . He said that judges should not be discouraged be Petitions against them, noting that as long as they have clear conscience , they should go ahead with the administration of justice . He said: "If we rely on what we hear , we will not be releasing official funds to the judiciary as constitutionally required for fear that people will misinterprete it." The governor thanked the State Chief Judge for the improved revenue from the courts. He said that the achievement is as a result of the blocking of leakages by the Chief Judge . He appealed to lawyers to pay their taxes so that the state government will continue to to deliver on projects. In her remarks, Chief Judge of Rivers State, Justice Adama Iyayi said the gesture of the Governor will help in the administration of justice. She also commended the governor for his infrastructural development in the judiciary.